Back row : (left to right) Robert, Mike and Yours truly! A holiday is only as good as its group. Travel companions can make or break your holiday. My companions made mine. As a group we had so much fun that the minor travel troubles that we encountered on the way were quickly forgotten. I can never forget the fun filled group dinners and lunches, the games of cards, the nocturnal sub-committee meets or the final day group raffle. They are all memories I will cherish for the rest of my life. As a group, I am sure that, all of us would like to thank Saskia, our tour leader, for making the trip a grand success. 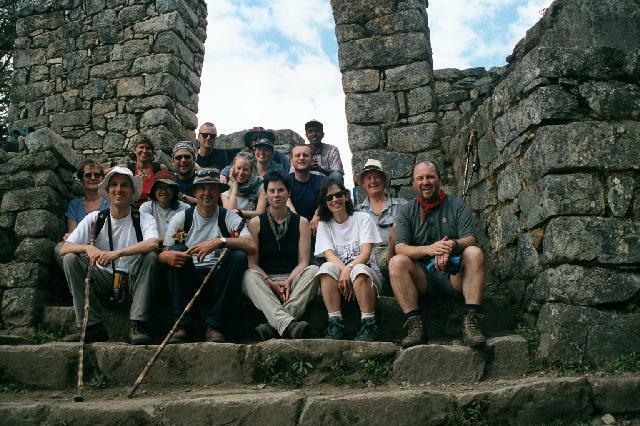 Amongst the guides Enrico in Pachacamac, Edwardo in Titicaca and Antonio in Machu Pichu deserve a mention. Their knowledge of the areas was wonderful and we learnt a lot about Peru, its people, its culture and its history from them. I hope that all the final day talk of meeting up for another trip materialise. I don't think I would be able to forget any of my travel mates - Matt and Mike, my room mates during various segments of the trip, Val, my lunch/dinner partner, Julie, my first friend, Robert and James, my camera/photography consultants, Juliet and Julian, my physicians on the trip, Susan and her advice on life, David, the cricket lover, Susan, the American, Deb and Cliff, the Aussies, and least of all Mike, the triathlon runner.